Disney World in February - Crowd Information, Ride Closure & Refurbishments and Special Events Information in one easy list. February has low to moderate crowds except for Presidents Week where the crowds spike. The weather is cool and enjoyable. 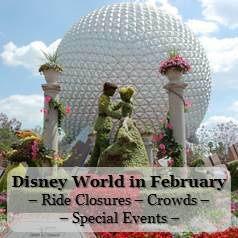 Keep reading to find out about crowd warnings, ride closures and refurbishments, and special events during your February visit to Disney World. Disney’s Typhoon Lagoon will be open, weather permitting, until it closed for refurbishment from (Dates to Be Announced). Disney's Blizzard Beach Water Park will be open (Dates to Be Announced), weather permitting. Crowds are moderate for most of the month. Presidents Week is very busy - only slightly less crowded than Spring Break - and you'll definitely want to arrive early at the parks and have a good touring plan in hand. Disney Princess Half Marathon Weekend - February 20 - 23, 2020. These events do not take place in the theme parks but you will notice runners and their families in your resort and, at times, visiting the parks. Registration opens on August 7, 2018. Extra Magic Hours - The Extra Magic Hour(s) Park is always going to be the most crowded park of the day but crowds are going to be low enough that it shouldn't be an issue, other than the days just before and after Presidents Day. During that time, crowds will be higher and you really need to think about your overall energy levels as you battle crowds and stay up late or get up early. It might make more sense to enjoy more attractions in less time by going to a less crowded theme park. Fantasmic! at Disney's Hollywood Studios - Fantasmic! will probably have at least one performance every night in February. When two performances are offered, the later performance will always be less crowded than the earlier show. Warning: This show is excellent but it does feature villains for a good 8-10 minutes and the lake catches fire, which can be frightening to some small children. Don't get overwhelmed by the details - let us help: Crowds, park hours, entertainment schedules , and dining options are a lot to think through but vacation planning is always a lot easier when you have one of our Disney-focused travel agents on your side. Imagine how much better your vacation will be when we give you a "Best Days" itinerary that puts you in the best theme park for each day of your trip, book dining reservation on your behalf (subject to availability) at times that don't interfere with parades and fireworks, and by give you excellent theme park touring plans that keep lines to an absolute minimum. We eat, sleep and breathe all things Disney so you get all of this expert service at no extra charge when you book your Disney vacation through Build A Better Mouse Trip. Click here for more information. Super Bowl - . Click here for a list of places to catch the Big Game at Disney World. The Epcot International Festival of the Arts - Dates to Be Announced. It will run seven days a week with extra entertainment offered on the weekends. This event celebrates Visual, Performing and Culinary arts. Disney Springs - The Lego Store offers periodic activities like building events or Lego Club meetings, and special offers. Click here for the current month and next month's calendar.